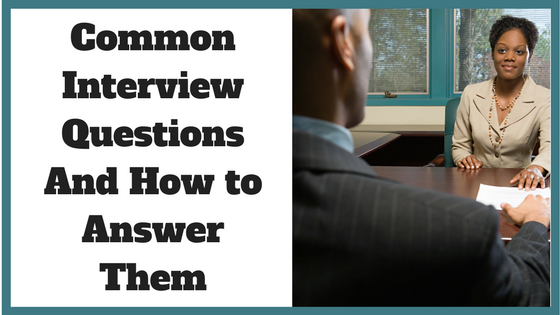 Interviews can send shivers of terror down your back – but they don’t have to. With some preparation and practice ahead of time you can reduce the anxiety and even enjoy (maybe?) the interview process. Do you want the job? Are you a fit for the job and company? A common questions employers may ask is, “What are your strengths?” Be careful with this question. If they ask you to tell them about three of your strengths – answer with three strengths, not two or four. This demonstrates you can listen and follow directions. So, how do you answer this question? Provide strengths and then back them up with examples. Another common question is “What is your weakness?” This can be a tricky one to answer, as it’s natural not to want to point out your faults during an interview. You want to show how you are working on the weakness – but not how you have solved it, as then it isn’t a weakness anymore. Talk about what you have learned in the process. You might even try a little humour by answering “chocolate” as your weakness, but be prepared with a serious answer to back it up as well. Employers hire people that want to work for them. When there are several candidates with the same qualifications often employers will select the one that is most enthusiastic about working in their company. In order to genuinely show your interest in the company you are interviewing with, it’s a good idea to do some research on the company prior to the interview. That way you can demonstrate that knowledge around some of the projects, expansion plans or other things the company might be doing. Are you a fit for the job? The final category is probably the most subjective for the employer. They want to understand if your character, values and interests fit within their organization’s culture and the team you will be working with. “Do you work well on a team?” may be a question under this category. You might also be asked, “What are your interests?” The employer wants to understand if you will get along well with other members of their team and their company culture. Learning about your interests offers insight into who you are as a person and how you might handle stress. Interests can be a connection point with the interviewer too. Prepare ahead of time by thinking of all the potential questions you may be asked and practicing with a friend or family member. Wherever possible give examples with your answers. Stress your interest in the job/role/company (unless you really aren’t). Bob* never had an interview. After being in the same frontline role for over 15 years he decided he wanted to move into a leadership role. After being told he was one of the shortlisted applicants he needed to prepare for the interviews. He had no idea how to do this. He hired me to coach him through the process. We started out by looking at his values and strengths and what he personally could bring to the role. After three sessions he was ready for the interview process and three interviews later the organization offered him the job, which he happily accepted! If you need a little help nailing that interview, email me at mary@mlkcoaching.com to learn more about my interview skills package. Originally posted on Noomii Career Blog. Would you like to receive job finding tips and newsletters? Subscribe below!